Shutterfly's Long Live Summer Photo Contest! Summer is in full swing and if you're like me, you already have tons of photos from BBQ's to fireworks to pool parties. In honor of summer,Shutterfly launched their new Shutterfly’s Long Live Summer Photo Contest on Facebook. It began last Monday and will run for 5 weeks. copy of the new Lonely Planet travel photography book. • Grand prize: trip for 4 to Bahamas, 4 nights, family photo shoot!! To enter: Just head over here and upload your favorite photo and caption based on the theme of the week. PLUS, everyone who enters gets a gift from Shutterfly just for entering! Don't worry about missing last week's theme. You can enter at any point during the 5-week sweepstakes period. 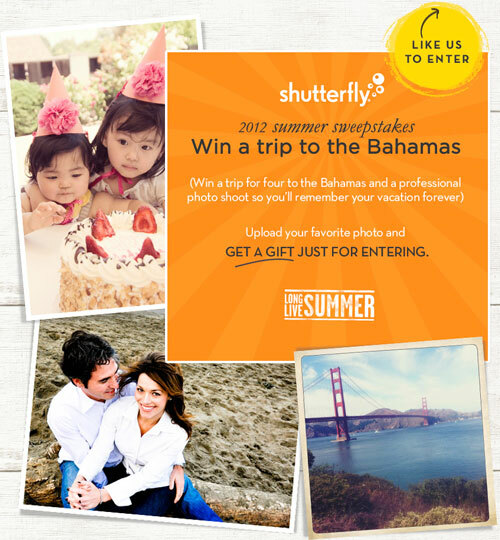 For more information, check out the Shutterfly Sweepstakes - Official Rules. Disclosure - This is a sponsored post. I will recieve a free Shutterfly product for participating in this blogging campaign. I only post about products/services that I do/would use myself.